This species has naturalized in 25 counties in California (Calflora), all along the coastal counties, but also in inland in Siskiyou, Butte, Nevada, El Dorado Riverside and San Bernardino. Worldwide, occurrences that mach California's climate include Australia (New South Wales, Western Australia and Tasmania, Victoria and South Australia); Central Mexico, mountainous areas in Chile and Argentina; areas in Central China. The PIER risk assessment lists "no" for "Agricultural/forestry/horticultural weed" and "Environmental Weed." Queensland Government Biosecurity site lists this as an environmental weed in Victoria, Tasmania and the ACT. As well, this site indicates that in Tasmania it is regarded as having the potential to dominate native vegetation. The Victoria Australia agriculture site: "There is little evidence reported on this species impact in natural systems. In a study to determine the species potential as a biomass crop, it was determined to be a poor competitor with other weeds (Garcia-Baudin et al 1985). Therefore at the most, the species is considered to have the potential to cause some minor displacement the herb layer and lower strata." However, on the Queensland site: "For example, it is listed as a major weed species in the Brisbane Ranges National Park and has been actively controlled by community groups in Warrandyte State Park." According to Witt 2011 (citing others): It has been recorded as being invasive in China (Harvard University, 2007) and in New Zealand (Webb et al., 1988)." BLM Arcata California sites notes that it is "invasive and spreading in many regions." From the Queensland Biosecurity Site: "In Victoria it is listed as an invasive weed of riparian shrubland and riverine escarpment shrubland plant communities. It is also on local environmental weed lists (e.g. the Mount Alexander Shire common invasive garden plants list) and is present in conservation areas in this state. For example, it is listed as a major weed species in the Brisbane Ranges National Park and has been actively controlled by community groups in Warrandyte State Park." These areas are in a similar climate to California (Brisbane Ranges NP is adjacent to the coarse-scale climate match area, and Warrandyte SP is in an area that matches). Burea of Land Management (0). BLM Arcata Field Office Noxious Weeds. Much of the native range distribution in Europe matches California's climate, including Spain, France, Italy, and other Mediterranean areas. The species occurrences in GBIF extend northward into France and Germany, the UK and Scandinavia, most of which does not match California's climate. Worldwide, there is a similar split, as noted in Q2, California, Oregon and Washington; Australia (some, but not all areas in New South Wales, Western Australia and Tasmania, Victoria and South Australia); Central Mexico mountainous areas in Chile and Argentina; a few areas in the US eastern Appalachian Mountains; areas in Central China all match California's climate. Areas that do not match California's climate that list occurrences in GBIF are in the US: coastal Massachusetts and Maryland; in Australia- occurrences in Tasmania and areas on the coastline of New South Wales and Victoria do not match; the occurrences in New Zealand do not match. However, it seems based on the native range matches, the occurrences in a wide swath of California and other areas worldwide that 50% or greater of the occurrences match California's climate. The only indication that this species may overtop native vegetation seems to be the suggested potential to do so. Several sources indicate that it is a poor competitor. From the HEAR Risk Assessment: "(1) Most concern about this species appears to stem from its rapid rate of local spread and/or high local abundance in some situations (Fox 2004, Jordan 2006). In California, Fox (2004) notes that "populations in wildlands are usually not large enough to cause significant impacts." Although one source noted it to have a "competitor" (as opposed to a "ruderal" or "stress tolerator") life strategy (Milbau and Stout 2006), no reports of significant replacement of other species were found. In fact, Parsons and Cuthbertson (2001) noted that it is "highly sensitive to weed competition", and it was observed to be out-competed by Japanese knotweed at a site in Boston, MA (Rice 2006)." Victoria Weed Risk assessment is similar: "As a reasonably large herb species E. lathyrisis not reported to cause major displacement of other species and is therefore unlikely to reduce biomass. Invasion by this species is likely to result in direct replacement of biomass." No evidence was found of promotion or change of fire regime. In addition, the two other risk assessments list "no" or "unknown" for this or similar questions. 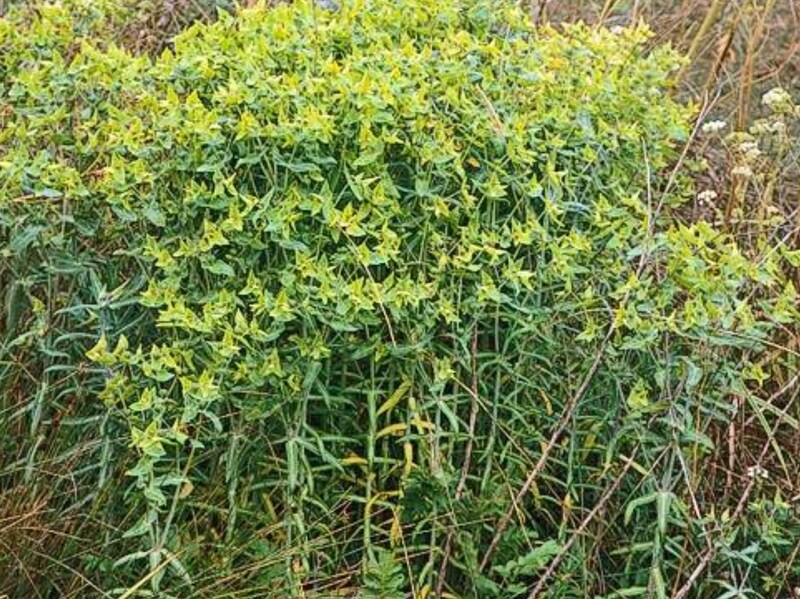 Ditomaso and Healy state that the sap of this plant is toxic to humans and livestock when ingested in a sufficient amount, however, "animals generally avoid consuming caper spurge if more palatable forage is available." The BLM Arcata field office states that "All parts of the plant, including the seeds and roots are poisonous. Handling may cause skin irritation as the plant produces latex. While poisonous to humans and most livestock, goats sometimes eat it and are immune to the toxin. However, the toxin can be passed through the goat's milk." Therefore, health concerns would include consuming goat's milk with the toxin, and as this is a horticultural plant, contacting the latex sap by humans. Also notable, the Victoria agriculture site cites a study indicating that this species (due to chemical composition of biomass) may have a negative impact on amphibians: "Extracts from dried plant material of this species was found to be highly toxic to amphibians, at higher doses death can occur but even at lower concentrations the growth and development of frogs can be inhibited (Paulov 1993)." Center for New Crops & Plant Products (0). NewCROP the New Crop Resource Online Program. Herbaceous plant, 50-150cm tall, in long little-branched stems, not likely to form thickets, and other risk assessment lists "no" to this. That said, the sap is toxic, but no evidence that it negative affects animals as they pass by/through infested areas. Spreads by seed. Well-documented species due to its crop potential, but no source lists vegetative reproduction and all indicate reproduction by seed specifically. Spreads by seed. Well-documented species due to its crop potential, but no source lists vegetative reproduction and all indicate reproduction by seed specifically. PIER assessment lists "no" to this question. BE Kingsolver notes germination rates >64% for the seeds obtained for her experiments. Kingsolver, B. E. (1982). Euphorbia lathyris reconsidered: Its potential as an energy crop for arid lands. Biomass. 2, 281–298. Significant spread by seed seems to be indicated as in a population in New York which went from 30 to 300 plants the following season. The PIER assessment as noted indicates that the concern of this species, despite being a poor competitor seems to be from its rapid seed-in in new areas, implying a high seed set. However, a paper on seed yield indicates 4 radial stems branching up to 8 times, with a terminal bifurcation (2) branch, and 1 flower per branch with 3 seeds, or a maximum of 192 seeds. Even with a 4-branch (as in Jepson), this puts maximum at about 800 seeds per plant. Lamont, E. E., & Young S. M. (2006). Noteworthy plants reported from the Torrey Range—2004 and 2005. The Journal of the Torrey Botanical Society. 133, 648–659. Hondelmann, W.., & Strauss D.. D. (1990). Path-Coefficient Analysis of Seed Yield Components in Euphorbia lathyris L.. Plant Breeding. 105, 112–116. Kingsolver study noted germination rate with no treatment at 64%. Annual to perennial plant, flowering in the first 1-2 years. Jepson lists flowering time as "all year" and the BLM Arcata site indicates multiple seed sets. Hondelmann and Strauss indicate a long flowering period from early summer to late fall. Due to the toxic nature of the plant, it is unlikely. Also noted in PIER assessment as a "no." Seeds are too heavy to be dispersed by wind and have no adaptations for such. PIER indicates occasional dispersal by water and Ditomaso and Healy also indicate dispersal with water; however, the degree to which this contributes to spread as a whole was not available. Comment from Denise Knapp: I think the answer should be No for this question, given that the literature indicates that water dispersal is occasional. The critieria state that wind or water dispersal should substantially contribute to the spread of the species. I don't think there is sufficient evidence to support this. Spread in New York was indicated from garden waste. Ditomaso and Healy indicate vehicle tires and landscape maintenance as contributing to spread. Reviewed by Denise Knapp, Eric Wrubel and Barbara Castro.